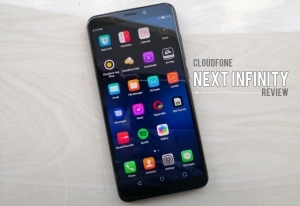 The Cloudfone Next Infinity smartphone. 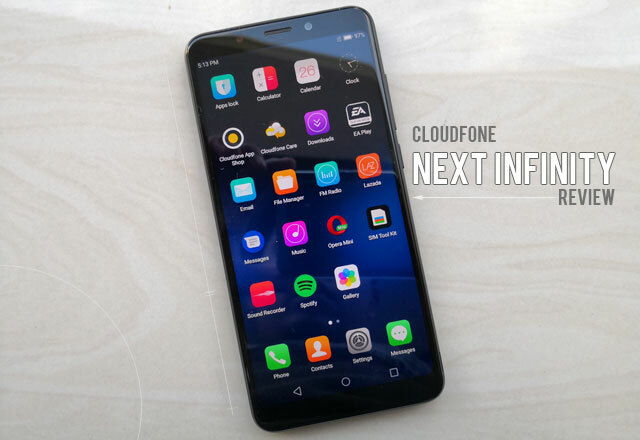 The Cloudfone Next Infinity is the most affordable smartphone among the four models of the new Next Infinity Series. It has the defining feature of the series – an Infinite Vision Display with 18:9 aspect ratio. However, it lacks the dual camera setups of its more expensive big brothers. Let’s take an in-depth look at the device and see its merits and issues. The back of the Cloudfone Next Infinity. 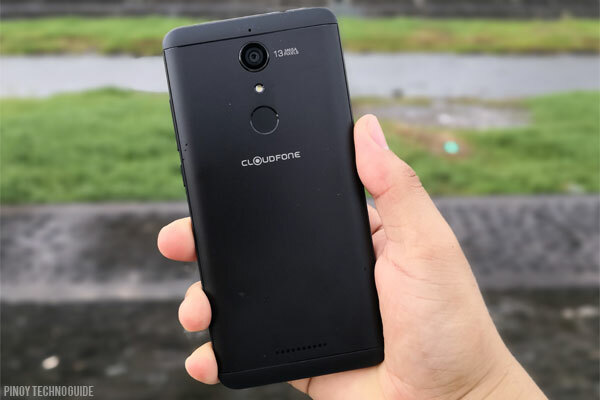 In the unboxing video of the Cloudfone Next Infinity, I noted the compactness of the device. A smartphone with a 5.7 inch display used to be too large but that’s not the case here. It’s comfortable to use and operate with one hand. This is the beauty of the 18:9 aspect ratio. The back cover is surprisingly removable – a rarity in today’s smartphones. It gives easy access to the battery compartment, SIM card slots and microSD card slot without the need for an ejector pin (the most commonly lost phone accessory). It feels solidly built with no creaks or weak snap points since the back cover is metallic, not a flimsy piece of plastic. The power and volume buttons are all on the right side of the phone with the former having grooves that make it easily identifiable by its texture alone. A microUSB port resides at the bottom while the 3.5mm audio jack is on the top. Overall, the design looks and feels modern with a touch of traditional functionality. The 5.7 inch screen of the Cloudfone Next Infinity is one of its best features. Its small size gives it a higher pixel density than the Next Infinity Quattro and Vivo V7. Hence, texts and graphics look sharper. It’s bright enough for texts to be readable under direct sunlight but pictures will look a bit faded. You’ll need to be in a shaded area to properly view photos after shooting them in, say, a sunny beach escapade. Nevertheless, the narrow bezels on all four sides make up for it. Its footprint is similar to a 5 inch phone from the previous years. This is something that people with small to average hands will appreciate. The Cloudfone Next Infinity is equipped with a 16 Megapixel front camera. Majority of selfies look good when taken in good lighting condition. Colors look natural and faces look lively with a bit of overexposure for bright backgrounds in an effort to brighten up the image. In low light environments, the front camera struggles to produce grain-free selfies. Thankfully, there’s a front LED flash to improve the image quality. It does its job but you need to be still for a blur free picture. On the back of the device is a 13 Megapixel main camera. It has the lower resolution but the image quality is actually better compared to the front camera. It’s not the best smartphone camera by any measure but it can produce stunning images with a little application of the basic principles of photography. Setting the HDR mode to Always on helps a lot too. 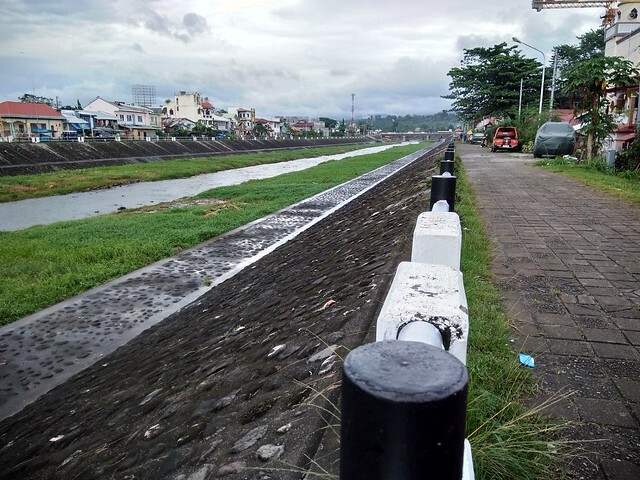 It ensures good exposure and dynamic range since the Auto mode tends to favor either the extremes in brightness or the dark areas leaving the other over or under exposed especially in landscape photography. Taking pictures of people, objects, pets and other subjects that are not too far from the device will almost always result in a good image. The accompanying LED flash is bright and makes pictures shot at night worthy to be uploaded to your social media accounts. Meanwhile, video recording tops at 1080p for both the front and rear camera. Antutu scores of the Cloudfone Next Infinity. 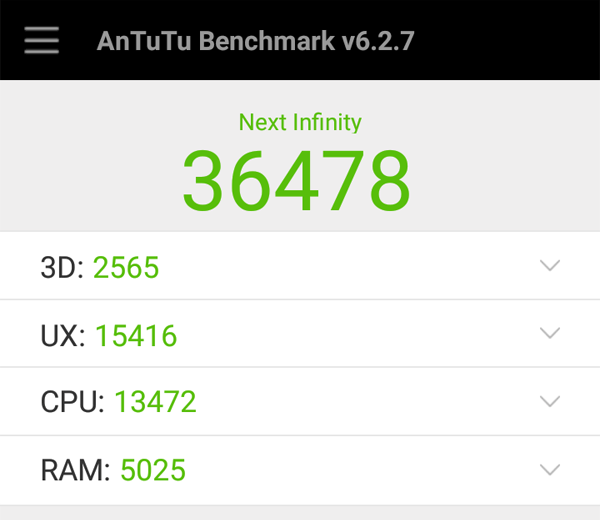 The Cloudfone Next Infinity got an average score of 36,478 points on Antutu Benchmark. That’s a mid-level performance. Swiping and scrolling through the user interface is generally smooth. There are several occasions when the device shows lag but it might be due to the software instead of the hardware. It’s powered by the Qualcomm Snapdragon 425 chipset with a 1.4GHz quad core CPU and Adreno 308 graphics processor. 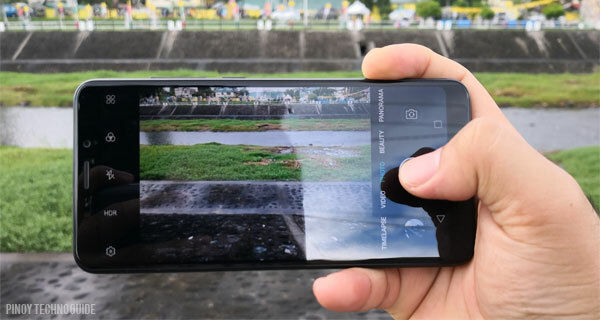 Smartphones using this chip but with a near-stock version of Android such as the Motorola Moto E4 and even the Xiaomi Redmi 4A with the EMUI software have smooth performance. Thankfully, gaming performance is great for its price. I tried playing popular games such as Mobile Legends: Bang Bang, Asphalt 8: Airborne and Real Racing 3. All three run smoothly in low to medium graphics quality and just a few hiccups in the highest graphics setting. The device also remains cool while playing games even while connected to a Wi-Fi network. An issue with device temperature arises when playing online games through a mobile data connection. I once recorded a battery temperature of 45°C while playing Mobile Legends at noon with mobile data and hotspot turned on. It’s one way of abusing your smartphone. Based on Antutu’s CPU stress test, the device still performs at its peak despite a full load or a high temperature. This is expected since the Snapdragon 425 has a stable CPU. Just avoid playing using mobile data or use the free phone case otherwise to make it more comfortable to use. Take note that it has 16GB of internal storage with around 7.65GB used by the system. Hence, you’ll easily hit the limit by installing a lot of games with huge game files. Thankfully, there’s a microSD card slot for your photos, videos and other files. Quick shortcuts, home screen and settings. The user interface of the Cloudfone Next Infinity is undeniably iOS-inspired. The icons, colors and even the shutdown menu all have the Apple feel. Themes can be applied if you prefer a different look though. I mostly prefer a stock version of Android but it’s also easy to fall in-love with this clean and organized user interface. I just wished it was smoother. There’s also an issue with how the quick shortcuts are accessed. You have to swipe down then swipe left to access it. 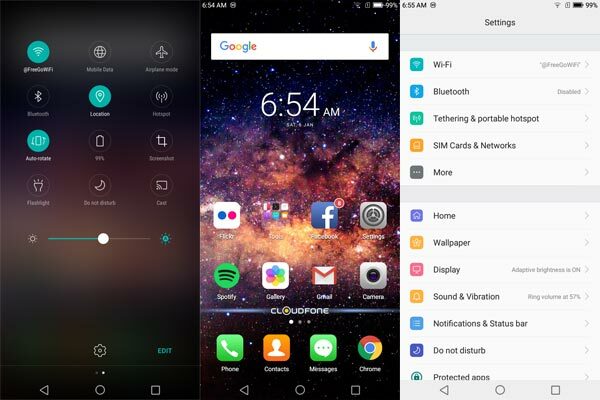 It would be better if Cloudfone makes it similar to the Cloudfone Next Infinity Quattro where the quick shortcuts can be accessed by swiping from the bottom of the display. It supports some gesture controls such as double tap to wake up the screen, flip to mute and direct calling by placing the phone near your ear. I tried calling my wife using the Cloudfone Next Infinity and her voice sounded as sweet as ever through the phone’s earpiece. Text messages are received on time too. There were several days when I used the device as my main source of internet connection. It provides decent 4G speed and has the option of connecting to 4G networks only. Sending files through Bluetooth is average in speed while copying files from a flash drive through a USB OTG connection is fast. Just like other budget smartphones, the Cloudfone Next Infinity has a tinny loudspeaker with almost no bass. It’s still enough for placing calls on loudspeaker but listening to music won’t be enjoyable. Using the free earphones improves the experience a lot. 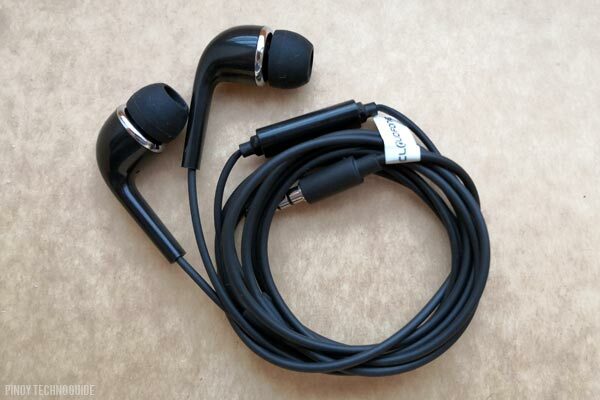 It’s the in-ear type resulting in bass that you can feel and even has a decent isolation from ambient noise. The wires feel strong too when I tugged at them and are somehow resistant to tangles. Spotify is already pre-installed so you’re just a log-in away from listening to your favorite tracks. The Cloudfone Next Infinity has a fingerprint sensor located at its back. It’s fast and reliable although it sometimes take a slight pause before unlocking the device. It also has a gyroscope for Augmented Reality and Virtual Reality applications. I tested this with games like Pokemon Go and it worked well. The ambient light sensor seems slow when adjusting the brightness of the display. It protects your eyes from sudden changes in brightness but I sometimes manually increase the brightness. 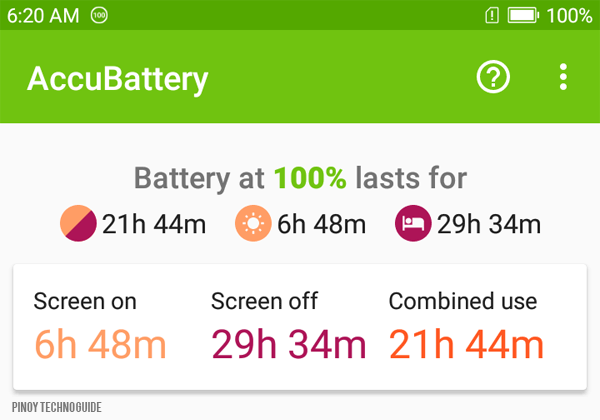 Battery performance of the Cloudfone Next infnity as measured by AccuBattery. The Cloudfone Next Infinity has a 2900mAh battery which is completely removable. You can take an extra battery while travelling and put it in when needed (although a power bank seems more convenient). There’s a sense of security knowing that you can just replace the battery if it falls below optimum performance. After a week of heavy usage, I got an average screen-on time of 6 hours and 48 minutes. That’s with gaming, 4G LTE data connection and hotspot function! A single charge can easily last a whole day on mixed usage while using it sparingly can make the phone last up to a day and a half. However, charging is a bit long at around 2 hours and 45 minutes! Using a fast charger won’t matter because the device only accepts a maximum of 900mA of charging current despite the 1.55mA output of its original charger. 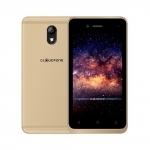 The official price of the Cloudfone Next Infinity is ₱6,999.00. That’s with the free phone case and screen protector. Its main competitors in terms of price are the Starmobile Up Selfie and Nokia 3. Both phones don’t have the 18:9 aspect ratio though. 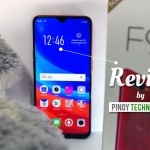 There’s a more affordable smartphone with a similar 5.7 inch display with 18:9 aspect ratio, the Cherry Mobile Flare S6 Deluxe at ₱5,999.00 SRP. However, it only has 2GB of RAM, 8 Megapixel front camera and a MediaTek processor. 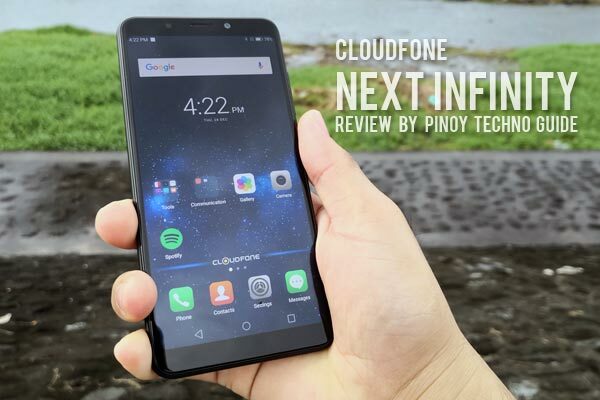 The Cloudfone Next Infinity makes the trendy 18:9 display within reach of budget conscious Filipinos. Its gaming performance, cameras and use of traditional removable back cover design also indicate that the company cares about what its consumers want. I’m looking forward to a software update that will fix the issues in its user interface. 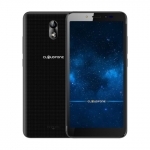 Cloudfone has even promised to upgrade the Next Infinity series of smartphones to Android Oreo! If you want to experience the beauty of an Infinite Vision Display, choose the Cloudfone Next Infinity! Average rating of 3.5 stars from 6 users. 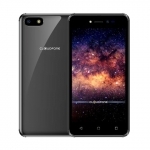 The Cloudfone Next Infinity is the right mix of modern features and traditional functionality.